» Albany rail project: It’s done! Albany rail project: It’s done! This new leg of the “wye” was finished but not yet in use in May, when the photo was shot. All year long I’ve been wondering and occasionally asking the Portland & Western when the railroad would start using the new section of Albany track that the state gave it nearly $7 million to construct. Now the long-awaited occasion has come and gone, and I missed it. 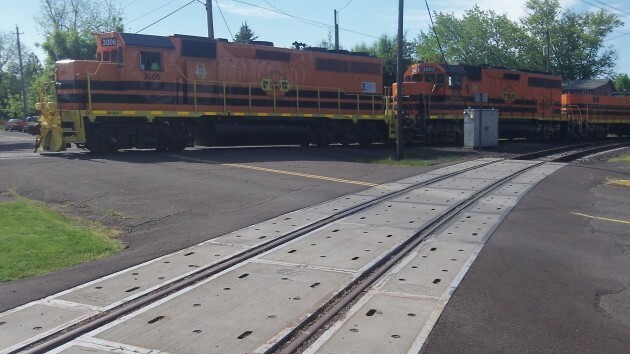 This project, with a total cost of about $8.7 million according to ODOT Rail, included expanding the railroad’s Millersburg yard as well as building a section of track paralleling the Union Pacific mainline from Madison to beyond Main Street, a distance of two and a half blocks. It also resulted in the rebuilding of one leg of the wye, the Y-shaped layout that connects the Toledo branch to the east-west rail lines. Under a contract signed in 2009, ODOT granted the railroad $6,990,516 toward the project under the ConnectOregon II program. Part of the goal was to eliminate delays that sometimes had freights coming off the Toledo branch (across the Willamette River) blocking several streets while they stood and waited for clearance to enter the Union Pacific mainline, which they had to do to get to either the Albany or Millersburg yards. The new track bypasses the mainline, and clearance from the UP is no longer needed for a left turn toward the Millersburg yard. Thanks to Councilor Ralph Reid, deceased, who fought long and hard to make this happen. Thanks Ralph for the vision and energy to stay with this project. Long term capital improvement take time and last longer than we do. We still honor your wisdom. I guess blocking Old Salem Rd. is the lesser of 2 evils?